I went for a brief morning “stay in touch” trip to see if the fish found this weekend were still in the same general areas. This fat-bellied 5.25 pounder slammed a crankbait chosen to just tick the bottom up shallow just before a mild cold front pushed in. The best fishing this morning came in the first hour of the day before the winds increased on the shift from NW to due N. During this time I boated 10 of the 24 fish taken during this trip. These fish came primarily from the vicinity of Area 999 and were hitting crankbaits hard. I also picked up one fish on the flatlines at Area 116. As the wind began gusting, I headed to give the “circuit” at Areas 336, 703, and 319 a try, and found fish mainly congregated at between Area 319 and Area 343. I boated a number of these via crankbaits and then, with the location of the biting fish being in such a tight radius, gave lift-dropping a bladebait a try, which resulted in the final 4 fish of the morning being boated. A 3/8 oz. white/blue model did the trick on this effort. These fish were found along the 6 foot breakline at and just yards to the S. of Area 319. Wind: Winds were NNW7 at trip’s start, turning N and increasing to 15 by trip’s end. Skies: Skies were high, clear, and blue with building high pressure. This morning I welcomed back Jenn (mom) and 15 year old Jess (daughter) Dietz of Round Rock. Jess was fishing, Jenn was an innocent by-stander, and I was doing the best I could to run the trolling motor and keep the fish perked up for my teenaged partner. 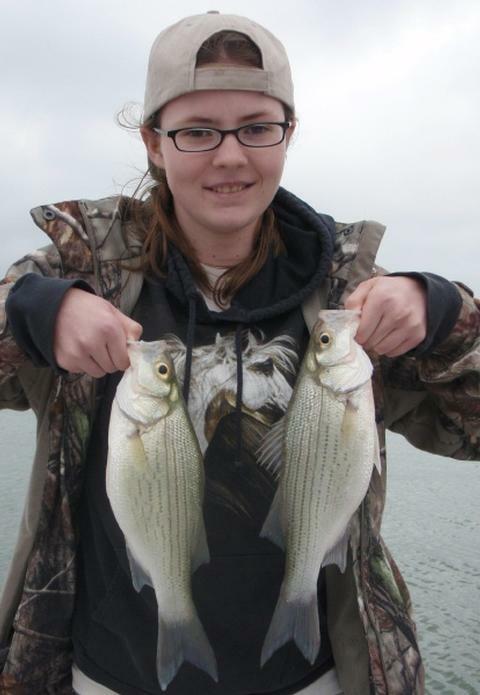 Jess D. of Round Rock with 2 of 45 fish we boated today. 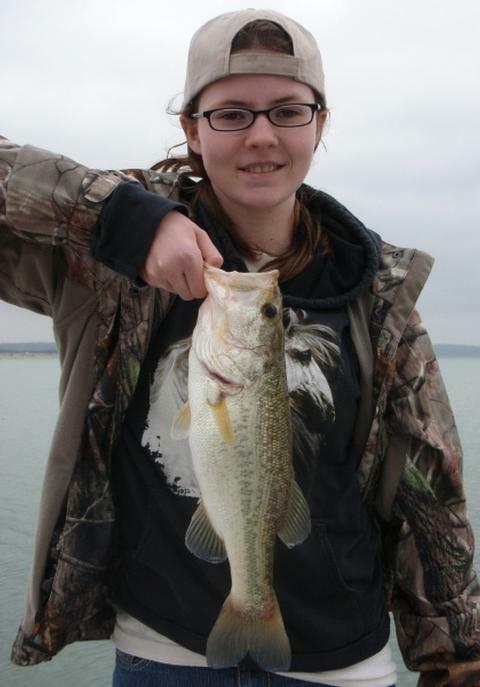 Jess with a scrappy black bass we boated amidst a mixed school of fish, all keyed on shallow shad. From the same 15′ x 15′ area came white bass, crappie, a gar, and this fish. With an obscured sunrise, things got off to a slow start before the skies brightened enough to kick things in gear. As we “treaded time” waiting for nature to wake up, we sniped a single white bass at Area 102 over 29 feet of water. With plenty of birds in this vicinity, but none taking flight and acting “fishy”, I decided to move and do some looking when the light level got just about right. We first spotted some action (BA:18T,4G) at Area 729, and noted as we fished that there were distinct pockets of activity from here southward nearly all the way to the bank. 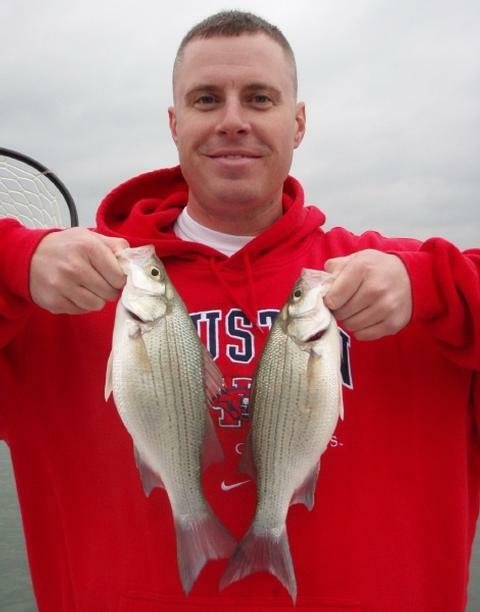 White bass were pursuing shad aggressively. We were catching them in 19 feet of water right where the flat breaks, but fish were found all over the flat, the break, and down to about 14′ over the channel. We spot hopped several times just trying to stay up with the action, and boated fish at Area 729 (4 white bass), Area 730 (8 white bass and 1 crappie), Area 727 (16 white bass, 1 crappie, 1 largemouth, and 1 missed longnose gar), and the span between Area 105 and 728 (11 white bass). In all cases, straightforward jigging accounted for most of the fish, with an easing tactic reviving the bite and perking up a few fish when things got quiet. We tried using a lift-drop technique today on a few occasions, but, the water is still a bit cool and this didn’t pay off as well as it will as the water warms a bit more. By about 11:15 the action was waning. We moved downlake to see if any residual bird activity was taking place, but found none. I sampled Area 161 and we pulled 2 short white bass off that area, but it was like pulling teeth at this point. We called it a day at that point and returned to the dock where I demonstrated for Jess how to assemble and use a slip bobber rig for sunfish. I left the two at the dock for a bit so Jess could practice casting without feeling the pressure of someone watch her as she worked the kinks out. When I returned, both were kind of grinning. I though perhaps they’d landed a sunfish after I’d just explained at length why not to expect to catch sunfish in the shallow water this early in the season. Well, that was not to be. It seems that Jess’ dad, Carl, who was accompanying her not-so-outdoorsy sister for the morning, was unwittingly dragged into a prom dress store to shop while dressed in his Saturday DIY project finest. Mom was, despite the cool, damp conditions, suddenly all too happy to be the one on fish patrol — hence all the grinning. Wind: SSE9 nearly the entire trip, changing suddenly to S11 right at 10:45. Skies: Completely grey and overcast to just shy of the point of misting. Encouraged by this morning’s results AND the fact that the warm, muggy S. winds and heavy cloud cover continued into the afternoon, contrary to the forecast, I did a bit of probing this evening in the last hours of daylight. 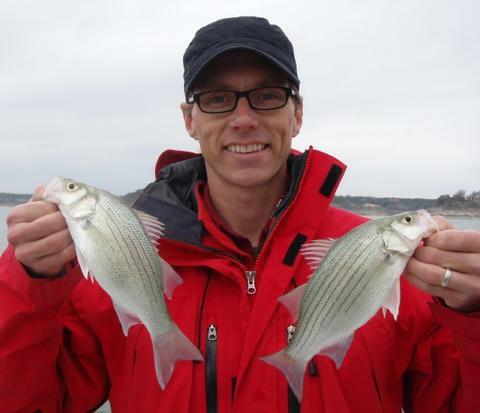 We had “white bass weather” all day today which got the fish up shallower and put them in the mood to feed. This screenshot shows gamefish and bait up high in the water column. I headed out at 4:45pm and fished until dark (~6:30). I found two distinct groups of fish, one at the base of the breakline in 25 feet of water off of Area 728 (picked up 9 fish there), and another group of fish right at the top of the breakline in 19 feet at Area 732. I was very appreciative of a fellow angler who motioned to me and told me that he’d found fish in the area, landed 6 immediately, and was continuing to see fish on sonar but not catch them. I accepted his invitation to join him (and kept my distance until that was offered) and also begin seeing fish on sonar. I was using a TNT180 in 3/8 oz, — all white; he had on an elongated slab in white and green. I was able to boat 18 fish in a matter of minutes right until the moment the sun set. At that moment the fish quit orienting to the bottom and began to rise up in the water column (I’ve seen this many times and theorize that it is to rise, along with the bait, to the more well-lit water near the surface to continue feeding in the failing light). As I witnessed this on sonar, I immediately began flatline trolling with crankbaits and boated 8 more fish in the last 15 minutes of the trip. I would mark today as the day that we “turned the corner” on Spring fishing. This is the first time I’ve seen fish up shallow and the first time this winter I’ve seen fish not only aggressively pursue a lure, but willing to rise quickly and go quite some distance for a lure originating some distance from them. It should only get better from here on in given stable weather and the absence of flooding rains. Skies: Skies were 80% cloudy. I fished again this morning with Army Captain Nathan H. Nathan is an easy-going, likable fellow who really has a desire to learn to fish better, and, most importantly, he is very teachable and listens well to the guidance I try to provide to enhance his success. We fished together for the first time late last week and, despite it being a slow day, Nathan took away some valuable lessons which he put into practice right away while fishing on his own the following weekend. He sent me a note that he’d like to chase white bass once again before he deploys later this spring, so, when I saw today’s favorable forecast (stiff SW winds, heavy cloud cover, in advance of a wind shift prior to a mild cold front) I gave him a ring. He rearranged a few things with his First Sergeant and we made a short morning outing with me out of it. On this, his 2nd trip in two weeks pursuing white bass, Nathan was much more adept at reading sonar, at knowing where his lure was in reference to the boat, bottom and fish, and then effectively reacting to gamefish as they showed on sonar. We boated 23 keeper white bass today including these 13 and 14 inchers. As we got going this morning, birds were present but not working fish. 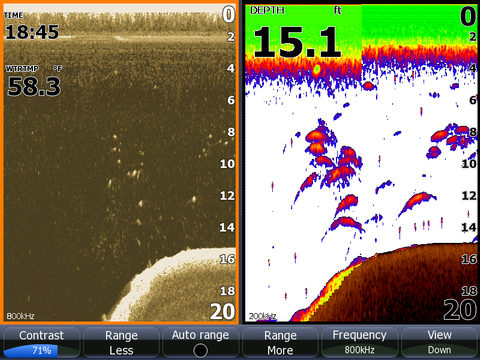 We used sonar to find ample numbers of suspended gamefish in and around Area 102. The water was warm enough and the fish were active enough to use a smoking tactic with TNT180’s (white, 3/8 oz.) to target those fish we found on sonar. At this area, every fish we caught was suspended. Over the course of the first two hours of the trip, we slowly put together a tally of 18 fish with only one hooked fish lost before being landed. Most of the fish that fell for our presentation first presented on sonar at around 14-23 feet and with schoolmates. Later, the fish seemed to push down a bit and were not as likely to be found high in the water column. After that action died, we headed to Area 161 and found some sluggish fish tight to the bottom in 22-23 feet of water. These fish responded best to an easing tactic. We boated 3 fish here before searching for greener pastures. Downlake from Area 161 proved to hold little today, so with Nathan’s report time drawing ever nearer and the bite beginning to soften, we returned to Area 102 and capped the day off with on last white bass for Nathan at that location. By 11:10 he was on the road and by 11:15 it was pouring down rain (the guy has great timing!). I expect great improvement in the fishing from this point forward, albeit weather dependent, as always. For our efforts today we boated 23 healthy, plump white bass. Skies: Completely grey and overcast to the point of rainfall right as our trip concluded. I fished from sun up to sun down today with returning guest Ryan S. of Temple. Ryan is 3 years into his residency at Scott & White and as a result, doesn’t have a whole lot of free time on his hands so it was nice that he chose to spend a bit of it on the water with me. I had let him know beforehand that the fishing had been hit or miss of late and that we’d been catching smallish fish, but, I think he was so ready to get out and do some fishing that he would have come no matter what the report was. A bit of piscatorial therapy was the doctor ordered, so to speak. As we got to talking over the course of the day, Ryan told me he enjoys challenges. Well, today was a challenge!! No trophies to report today — we were happy to find what we found and enjoy not being at the office while we found it!! Things started out pretty promising. We fished under some tentative bird action near Area 389 and Ryan had 3 hits but we didn’t capitalize on those. We moved on to some deeper water at a breakline at Area 211 and found some good looking sonar returns. We buoyed, fished, and immediately began catching fish, boating 15 fish (a mix of smallish white bass and juvenile hybrid) on slabs in short order. As the overcast conditions gave way to clear skies and diminishing winds, the fishing stopped almost immediately. We ran sonar in ever-widening circles around the area we’d just fished and there was nothing to be found — no shad, no gamefish, just nothing. We then struggled between 9am and 4pm to put together anything resembling a pattern as the winds grew calmer and the skies got brighter. Finally, after a sudden wind shift from calming SE winds, a NW breeze began at the lead edge of the cold front which brought in our first sub-50F temps in over a week. No sooner did that breeze kick in than we both boated a white bass while sniping over 40 feet of open water north of Area 412. Later, we flatline trolled for one suspended white just to the west of Area 378. By now it was approaching 4:30p and, despite the wind shift, we found no useful bird activity nor any helpful sonar reading despite traveling far and wide looking for both. We changed venues and went looking for fish in the lower end of the lake. We finally found a school of bottom-hugging white bass right on top of Area 579. We got slabs down among them and brought in 14 fish in short order including 12 white bass, 1 crappie, and 1 largemouth, thus nearly doubling our day’s catch in the last 30 minutes of the trip. these fish quit at around 6pm. We then began to see numbers of terns patrolling over 25-30 feet of water in some likely fish-holding areas, but, nothing materialized before sunset and both we and the birds went home to roost wishing we’d seen a little more today than we did. I mentally rated this as a below average day, especially given our week-long warming trend and the fact that we had a wind shift in advance of a cold front. The front did not come in with the classic strong S. wind, gradually transitioning to SW, W, then NW winds, rather, the light SE winds died for quite some time, then suddenly gusted from the NW only to slowly build in afterwards. I half-kiddingly told Ryan as we parted ways that I was glad to provide him with a half-day trip, only I regretted it took a full day to do it! Such is fishing. Yes, it was a challenge, but, it is the challenge that keeps you coming back for more and trying to figure out why, when you think you’ve put it all together, you really didn’t have it all put together! 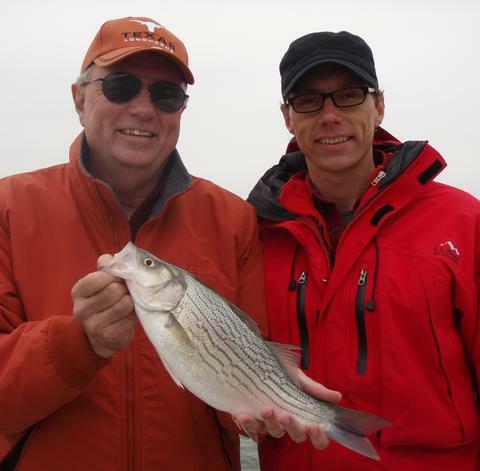 I was joined today on Lake Belton by Austinite Terry W. and his adult son, Matthew, a middle school teacher in Belton. The two had fished on occasion through the years but never focused on white bass other than during occasional topwater frenzies in the warm months. 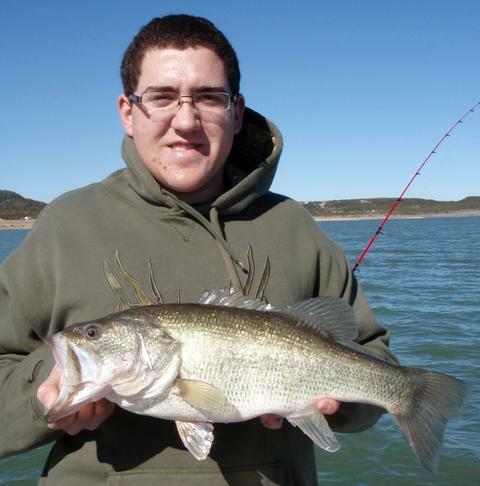 Matthew is fairly new to Belton and wanted to understand what manner of fishery Belton Lake offered. …and Terry was more about quality!! As is very typical this time of year, the fishing amounted to nil while the winds were calm. From our launch time at 7:15 and until around 9:45, there was very little natural activity from birds, fish, or animals. We fished the main basin and up into the Cowhouse arm during this time and caught exactly one fish (a white bass that was solo and suspended over 36 feet of water) near Area 132. As the wind began to slowly build out of the SSE, we found 2 flocks of gulls very tentatively working over open water in the main lake, but after running sonar and slabbing in and around these fish, we found nothing going on. We then headed a short way up the Leon arm. We found fish in two locations. First, at Area 726, (BA: 12G) we spotted some action from suspended fish at 11 to 24 feet down over a 38-40 foot bottom. We put downriggers down with White Willow spoons attached and immediately boated a just-short hybrid striper on a ‘rigger set at 11 feet. Continued passes yielded no more. I spotted some additional action nearby at Area 328 and so we picked up with the downrigging routine there and boated one largemouth on the ‘rigger set at 14 feet. As we moved about with the downriggers, I had a chance to study the bottom in detail with sonar and with StructureScan. As I did so, I noted a sizeable school of what appeared to be white bass holding tight to bottom at between Areas 709 and 725. We did a quick changeup and got ready to vertical jig. The fellows were already practiced at this as we had unsuccessfully jigged at several areas during the slack wind period earlier in the morning, so, they were already versed on how to lower, adjust, and work their slabs. When all was said and done, we’d boated from this fairly compact area exactly 74 additional white bass, and 2 additional short hybrid stripers, thus taking our total for the trip up to 79 fish. These fish behaved in classic winter mode: the first fish in any of the small schools we encountered was difficult to catch, but, once the ice was broken, the other individuals in the school then struck more readily. The bite was strong on a straightforward jigging technique, then slacked off a bit. At this point, the “easing” tactic was necessary to continue to catch fish, and, once that slowed down, a long pause in the stroke did the trick for the last few fish remaining willing to bite. Once a particular location dried up, we’d move about until we found fish on sonar and the process would repeat itself. We actually departed with fish still willing to bite, as Grandpa Terry (a.k.a. The Waffleman – a little inside humor) wanted to see his young grandson before naptime. One of the very first things I told the fellows while we were still in the parking lot before our trip began was that we’d struggle until we got some wind. They saw this truism play out in a very definitive way on today’s trip. A side note: On returning to the ramp I received a credible report from another Belton “regular” that fish had turned on near Area 712 and eastward parallel to shore once the wind began to blow. He managed 21 white bass and 3 hybrid during a feed that included bird activity. Wind: Winds were light from the SSE at near calm until around 9:45 when winds picked up to 8-10 and leveled off there for the remainder of the trip. Skies: Skies were 100% greyed over but still bright for the entire trip. We had another tough ride today, once again plagued with light winds and lethargic fish. I welcomed aboard today Nathan H., a native of Rome, Georgia, stationed here at Ft. Hood as a U.S. Army Signal Corp company commander. 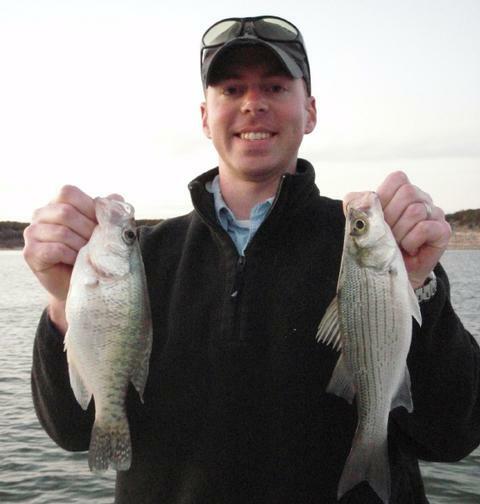 As crappie begin to show up in the “by-catch” when targeting white bass, the start of strong Spring white bass fishing is very near. Nathan recently bought a bass boat and is trying to put together the puzzle of fishing success. I’m sure I helped him place a good number of pieces today, but not as many as I’d hoped. Nathan was particularly interested in sonar interpretation, so, before leaving the dock I explained the principles on which sonar is based, and then showed on-the-water examples of graph readings, flasher readings, StructureScan readings (down- and side-looking) and we began interpreting fish, bait, structure, and topography. As for the fishing, there was some consistency, but the situation was really tough. We did consistently find fairly scattered, suspended fish either individually or in very small (2-5 fish) schools in 22 to 42 feet, over deeper (often much deeper) water (up to 65 feet). These fish would respond to a sniping tactic on about 1 in every 6-7 attempts. There seemed to be more fish and bait over top of the main lake holes along the old channel. We found next to nothing on bottom, especially in waters less than 35 feet deep. For nearly the entire trip we sat side-by-side; I ran the trolling motor and tried to keep us positioned so Nathan’s lure would hang vertically, thus allowing us to keep it on sonar. He did his best to follow my guidance on tempting the fish we found in an active mode, and managed to boat fish as a result. We didn’t get any breaks today, however, and wound up having nearly as many of Nathan’s hooked fish pull off as he landed. But, given that he was using unfamiliar tackle on an unfamiliar quarry with unfamiliar tactics, I’d say he still did pretty well. Areas where we boated fish included Area 372 (2 whites, 1 crappie), Area 339 (3 whites), Area 350 (south, over 50′) (2 whites), Area 329 (1 white), and Area 572 (3 whites). Before we parted ways, we went over every last question Nathan had typed out and had clipped to his clipboard and I presented him with a few choice baits to get him started as he goes out to try this on his own. Wind: Winds were calm until after 10a, then went variable from SSW to SSE at <7 for the remainder of the trip. Challenged by the stinging defeat of this past Saturday, I was up and back at ’em early this morning to try to figure these white bass back out after last week’s cold snap threw things into a funk. I launched at sunrise today to give the morning bite a try (something I’ve not done in a while due to predictably light winds in the mornings these past few weeks). I found only one pocket of activity this morning. Right at Area 348, just adjacent to the river channel birds were working in a ‘fishy’ manner (although there was definitely loon-influenced activity, too) here and after running sonar for a while, I found fish suspended from 12 to 40 feet deep over 50-52 feet of water. The only thing that would tempt these scattered, suspended fish was a sniping tactic. I used this technique to single out individual fish or fish appearing in pods of 3-5 fish, and catch then one at a time as they slowly mulled around in this area no doubt draw by the equally cold-stunned bait. By 9:30 most of the action was over with 12 healthy white bass landed for the effort. I did manage to pry two more fish — one white bass and one crappie — off the bottom of the river bend at Area 392, but the fish were once again locked down tight under clearing, brightening skies and calming breezes. I am very encouraged by this week’s forecast calling for highs in the low 70s and, more importantly, overnight lows that will be warmer than the surface water temperature is currently. This will create a net round-the-clock warming effect which will spur the upstream movement of the white bass and begin getting the crappie and largemouth back in the game. These last two species should start showing up in my catch these next 2 weeks. Wind: Winds were light from the SSE at ~7. Skies: Skies were overcast with thin fog until 9:30am. I’ve mentioned a number of times through the years in this blog that you are reading exactly what happened on the water. No fudging, no embellishments, no sugar-coating. I do this to lend credibility to all that I do and say. The bottom line today was … we got spanked!! I had a wonderful, experienced angler, Mr. Tom K. from Minnesota on board. He had about 9 days to choose from for his fishing trip during this Texas tour he took to escape from the snow up north. I tried to hand-pick the best day of the bunch for him and it just didn’t work out. Earlier this week we had our second deep freeze of the season with temperatures down into the teens and a second ice storm forcing school and business closings. Today was forecast to have increasing, warm SW winds in the afternoon. Instead, we had light, variable winds from the south, and the fish just never got going in the afternoon. Due to the unusually cold weather, more shorebirds have pushed into the area than I’ve ever seen before — we have all manner of gulls, loons, terns, kittiwakes, and more, but, all of the bird action I saw today was centered around the loons’ fishing activities and not fish pushing bait. The cold snap also pushed our water temperatures to what will no doubt be their low point for this season — 46F on the surface in many areas. We focused our efforts over and along the channel from the river to mid-lake and only boated 2 white bass and a single crappie, all on slabs. Fortunately, Tom caught all 3 of these. These fish came from Areas 722, 399, and 329 (only 1 fish came off each area). At no time did any of the hundreds of birds on the lake take flight and search for fish or bait being driven by gamefish. 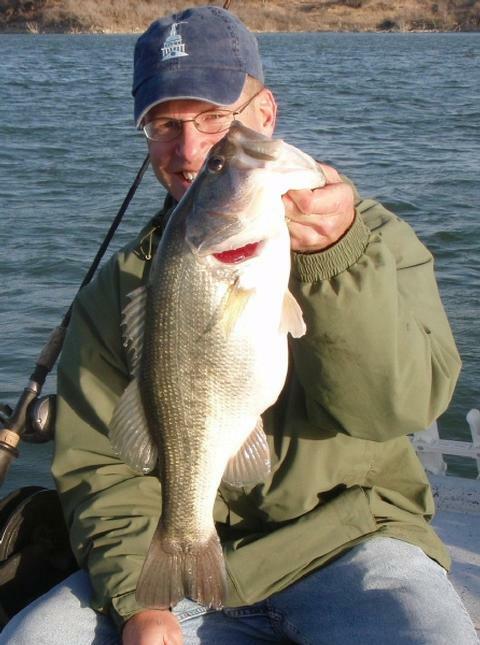 I spoke with fellow guide Henry N. who primarily focuses on largemouth bass. His club held a tournament on Stillhouse in the morning hours today. In their efforts, 52 fisherman returned to the scales with only 12 keeper bass. It was just a tough day all around and Tom and I were not immune. For better or for worse, Tom is a musky fanatic. Known as the “fish of 10,000 casts”, musky are hard to come by even when you know what you are doing. He’s gone on many trips and not caught a thing and kindly shared with me that he still enjoyed being out on unfamiliar waters (free of snow on the landscape!) and especially seeing the unique ways in which I use sonar. In a number of situations we were able to compare and contrast traditional sonar readings with StructureScan readings. Wind: Winds were light and variable from the S at calm to 5. After a successful scouting trip during the last 90 minutes of light yesterday, I felt very confident that the forecast calling for SW winds today would bring success. I contacted Eric M. of Belton last night when I saw the forecast. He’s been patiently waiting for over 2 weeks for me to hand-pick a good day of fishing weather so he could experience first-hand the vertical jigging techniques I use throughout the winter. Today, his patience paid off. Eric M. with the largest of our 83 fish taken in 34 to 39 feet of water today via slab spoons — a 4.75 pound, 20.50 inch largemouth. We launched at 1:30pm, just as the day’s winds came to a peak of ~16 mph and stayed ramped up at that speed for about 90 minutes. This brought with it the best fishing of the trip. We hit our first location — a deep flat — at Area 724 (BA: 12KW) and jigged for 16 white bass and then saw action at Area 337/723 (BA: 9KW). At this location (the end of an underwater spur), over the next 2 hours we boated 49 more fish, including one white bass measuring 15 3/8 inches, and a largemouth bass (our only black bass of the day) which measured 20.5 inches and weighed 4.75 pounds, as well as two drum. We used a straightforward jigging approach here, as well as a lift-drop technique for Eric to tuck away in his bag of tricks for future use. By 4:30, the wind had rapidly tapered off to under 6 mph, and the fishing slowed down right with it. We’d peeled all the fish off Area 723 that I felt we could, and so we went looking elsewhere. From 4:30 to 5:10, we looked at several areas and found little, until coming up on Are 329 at around 5:20p. At this area (a small underwater knoll), we found fish right at the shallower edge of the breakline in about 34 feet of water. We put 6 fish each in the boat in no time and then, like a light switch being turned off, the action stopped. I’ve seen this many times when a school of large predator fish come on the scene (largemouth or gar), but, we did not hook or land any such thing. We did re-establish contact with fish now suspended at 20-30 feet down over the adjacent river channel. It was here that Eric got his final lesson for the night — instruction on “sniping”. This method involves singling out individual suspended white bass on sonar and working a lure near them with ultralight spinning gear in such a way as to provoke a predatory chase and eat response. Eric really got the hang of this quickly and put the final 6 fish of the night in the boat via this method. We finished up our trip at sundown with a total of 83 fish boated for our efforts. I expected that we’d do well today, but I was actually surprised at how well we did, given the extended extreme cold of the last 5 days and the ~7 degree surface temperature drop we experienced over that time.